The European colonists brought with them to India, concepts of their World View and a whole baggage of the history of European architecture- Neo-classical, Romanesque, Gothic and Renaissance. The initial structures were utilitarian warehouses and walled trading posts, giving way to fortified towns along the coastline. They adapted to India the climatically appropriate Iberian galleried patio house and the Baroque churches of Goa. St Cathedral and the arch of conception of Goa were built in the typical Portuguese-Gothic style. The St Francis Church at Cochin, built by the Portuguese in 1510, is believed to be the first Church built by the Europeans in India. The Portuguese also built the fort of Castella de Aguanda near Mumbai and added fortifications to the Bassein fort built by Bahadur Shah, the Sultan of Gujarat, in AD 1532. The Bassein fort is famous for the Matriz (Cathedral of St Joseph), the Corinthian pillared hall and the Porte da Mer(Sea gate). It is evident in Nagapatnam, which was laid out in squares and canals and also in Tranquebar and Serampore. The French gave a distinct urban design to its settlement in Pondicherry by applying the Cartesian grid plans and classical architectural patterns. The Church of Sacred Heart of Jesus (Eglise De Sacre Coeour De Jesus), the Eglise de Notre Dame de Anges and the Eglise de Notre Dame de Lourdes at Pondicherry have a distinct French influence. It was the British who left a lasting impact on India’s architecture. They saw themselves as the successors to the Mughals and used architecture as a symbol of power. The British followed various architectural styles- Gothic, Imperial, Christian, English Renaissance and Victorian being the essentials. The First building was factories but later courts, schools, municipal halls and dak bungalows came up later, which ordinary structures were built by garrison engineers. The Church of St John at Calcutta was built in 1787 inspired by St Stephens’s church at Walbrooks. The Government House in Calcutta was built by Captain Charles Wyatt modelled on the Kedleston Hall of Derbyshire. The Indian Government Mint in Calcutta is a half-scale replica of the Temple of Minerva at Athens and the Pachaiyappa’s Hall in Chennai was modelled on the Athenium Temple at Theseus. The Secretariat, University Library, Rajabai Tower, Telegraph Office and the Victoria Terminus all followed the Victorian Gothic style. In Varanasi, one of the true Gothic monuments is the Queen’s College, built in a perpendicular style by major Kitoe from 1847 to 1852. In Calcutta, a High Court was constructed following the Gothic style. The Howrah Bridge (1943), with its red brick façade surrounded by eight square towers represents a combination of the oriental and roman styles. Fort William, the stronghold of the British in mid 19th century that took 13 years to construct at a cost of more than $3.5 million and the Victoria Memorial in Calcutta (1921), designed by Sir William Emerson, are probably the most imposing of all the British structures in India. The Chepauk Palace in Chennai designed by Paul Benfield is said to be the first Indo-Saracenic building in India. 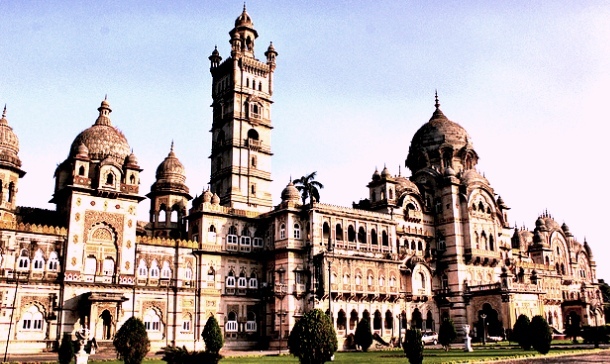 Other Outstanding examples of this Style of architecture include the law Courts, Victoria Memorial Hall, Presidency College and Senate House of Chennai, Muir college at Allahabad, Napier Museum at Thiruvananthapuram, the Post office, Prince of Wales Museum and the Gateway of India in Mumbai, the Maharaja’s Palace at Mysore and M.S. University and Lakshmi Villas Palace at Baroda. The architecture of New Delhi was the crowning glory of the British Raj Robert Byron described New Delhi as the Rome of Hindustan. The British built New Delhi as a systematically planned city after it was made the capital in 1911. The British Viceroy made Sir Edward Lutyens responsible for the overall plan of Delhi. He was specifically directed to harmonise externally with the traditions of Indian art. Thus, the Western architecture with Oriental motif was realised with Chajjas, jalis and Chhattris, as stylistic devices in the viceroy’s House (Now the Rashtrapati Bhawan). Herbert Backer added the imposing buildings of the South Block and the North Block, which flank the Rashtrapati Bhawan. Another Englishman called Robert Tor Tussell built the Connaught Place and the Eastern and Western Courts. Previous articleDo you know How to appoint A Governor?